At present around 76% of homes and businesses have been reached with “superfast” connectivity via purely commercial investment (mostly via Openreach’s FTTC and Virgin Media’s cable DOCSIS network), while the BDUK programme has largely been used since 2012 to help significantly extend this into less economically viable areas (rural, suburban, smaller towns etc.) via a mix of public and private funding. 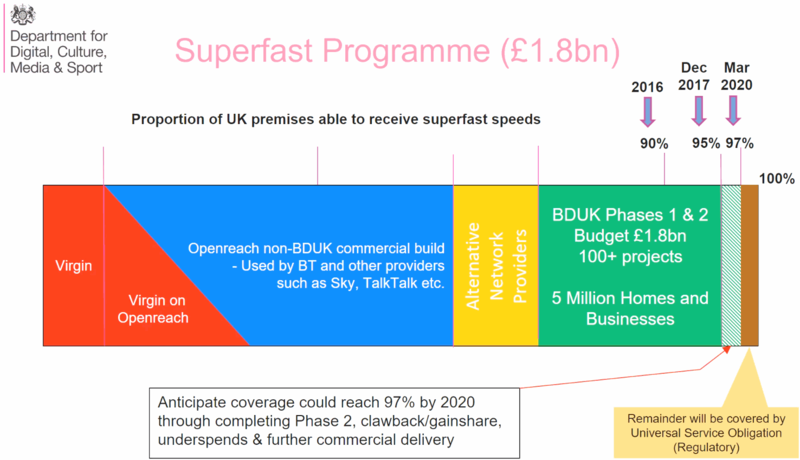 The last official BDUK Phase 2 target of 95% (national average) coverage was achieved in time for the end of 2017 (supported by various operators such as Openreach (BT), Gigaclear, Airband etc. ), although many of the contracts are on-going until c.2020 and if approved then some may run even longer in order to maximise the use of gainshare funding. NOTE: The most recently signed contracts tend to adopt FTTP in order to reflect the Government’s new strategy (nationwide full fibre by 2033). The BDUK contracts all included a clawback (gainshare) clause, which requires the suppliers to return part of the public investment as customer adoption of the new service rises. The funding can then be reinvested to further improve network coverage and speeds via future deals. Efficiency savings from earlier contracts can also be reinvested. So far it looks as if a total of around £721m could in theory be returned via clawback from BT and £210m (Jan 2018 figure) from efficiency savings, which may rise again in 2019 (details here and here). As a result the latest official forecast from BDUK now suggests that we could see superfast coverage hit 97% by March 2020. Remember this is not an official target and is subject to change. The result means that the remaining 3% of premises would have to be tackled through the Government’s new Universal Service Obligation (USO), which from the end of this year will make it possible for those in slow speed areas to request a broadband speed of at least 10Mbps (many will get much faster than this) from either BT (Openreach) or KCOM. Come 2020 this is estimated to affect approximately 600,000 premises. One catch to this is that those requesting a USO may have to wait up to 12 months before it’s delivered (assuming the operators aren’t swamped with requests early-on as that could create problems). Most people will see broadband via FTTC (VDSL2) or FTTP “full fibre” fixed line broadband technologies, but 4G fixed wireless solutions are also a possibility. We are currently still awaiting the final USO details from Ofcom. Meanwhile DCMS has said that they still hope to push beyond 97% towards 98%.